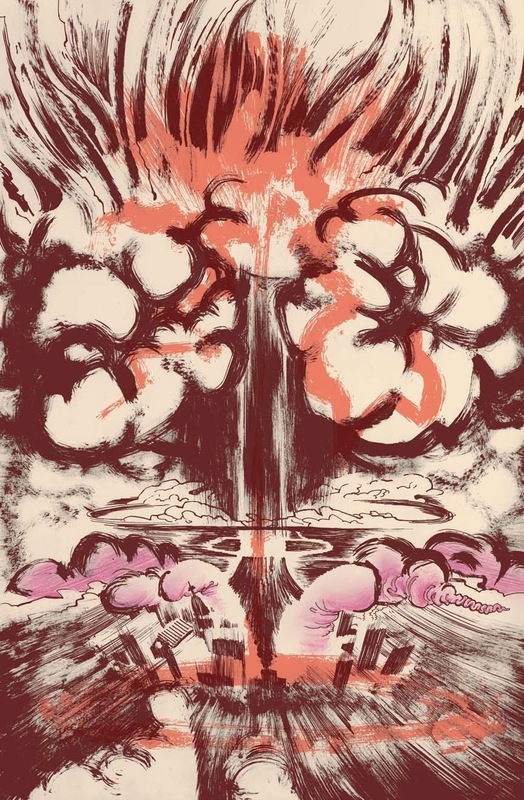 The cover to the first trade paperback. I love Michel Fiffe's "COPRA". Now, I should admit that I have only read the first six issues as collected in the trade paperback I bought at my local shop under the name, "COPRA: Round One," and the series is now up to its 18th issue, but Fiffe is already planning to release a second trade that takes us up to issue 12 by January so I anticipate I can get caught up pretty quickly between that and buying some of the single issues he sells via his Etsy store. Yes, he sells his self-published comics via Etsy, making him somewhat known in the indie-comics field as "The Etsy guy" as this fascinating interview he did with The Comics Journal discussed, among other interesting subjects. Fiffe is starting to do some, "Mainstream," work such as writing an Ultimate-Universe comic for Marvel (that sadly is already cancelled, but that has more to do with Marvel horribly mismanaging the Ultimate Universe lately as opposed to placing any fault with Fiffe). 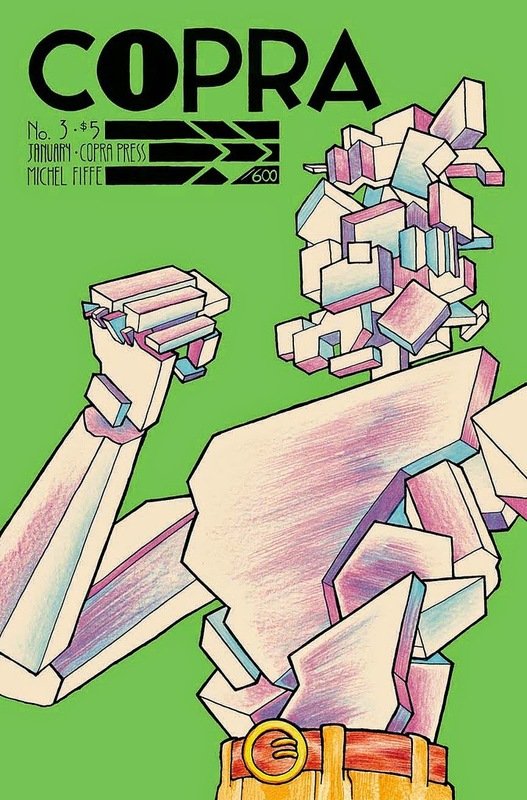 Before Fiffe became more known however he did some various comic-work with independent collectives and put out a one-man anthology known as "Zegas". 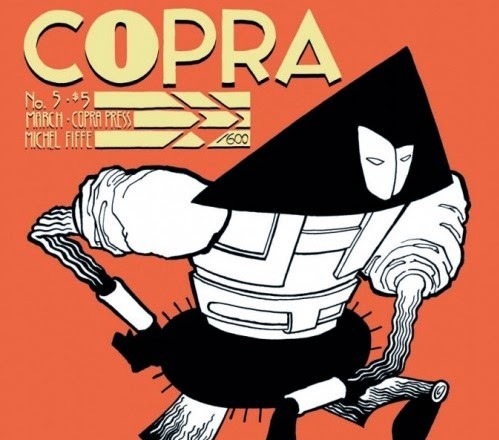 "COPRA" is his work that has taken him from being a quality independent comic-maker that few people know of to a quality independent comic-maker whose work has become a certifiable hit--and upon reading "CORPA" it is easy to see why. 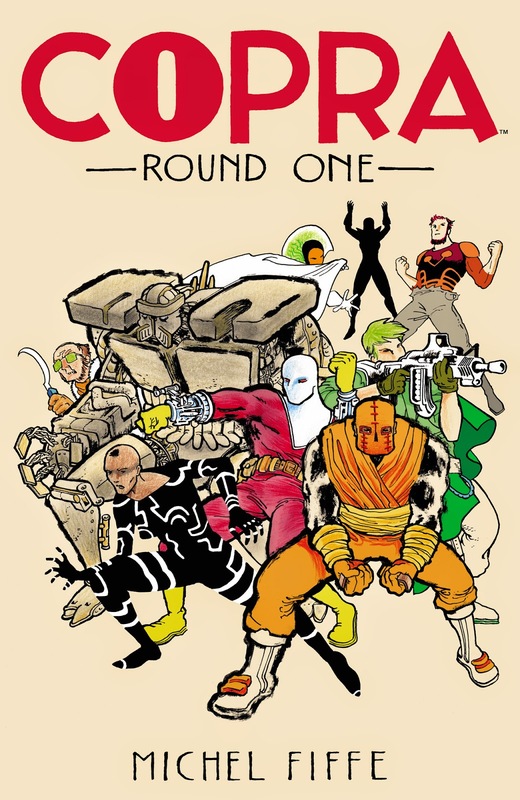 "COPRA" draws inspiration from "Suicide Squad"
I've told you how I love "COPRA" but I have not yet actually told you what the comic is about, have I? Basically, it is a bit like DC Comic's Suicide Squad in that it is about a government group made up of questionable characters. 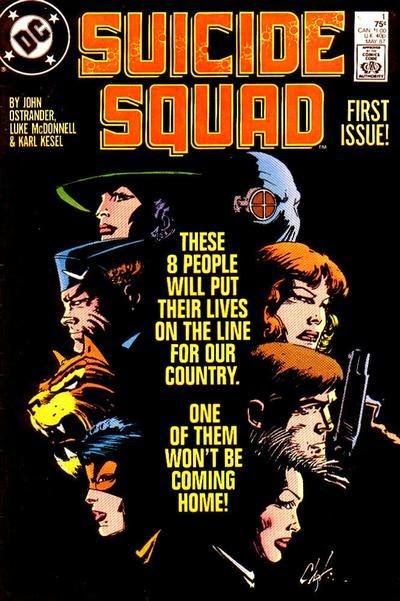 If you aren't very familiar with any comics featuring "Suicide Squad" then don't worry because I have barely any knowledge of it either, besides having read some of the New 52 version that this doesn't draw from as much as apparently when the comic was done by John Ostrander in the 1980's. So yes, this comic has a spiritual debt to that DC title (Fiffe was such a lover of it he even made his own unofficial fan-comicbefore doing "COPRA") but it is of course in its own universe of Fiffe's making. Fiffe writes, illustrates, and does the coloring for this comic, so it is all purely his own vision and no one else, so even if there is the inspiration of "Suicide Squad" in this title it is very much its own beast. There is the initial concept that COPRA is a black-ops type entity that runs secret missions for the government, and it is run by an individual known as "Sonia Stone", but where does Fiffe go with this? Well, in the first issue he blows it all up--literally. We start with COPRA on what was supposed to be a simple mission acquiring a strange alien artifact, but then half the squad we are introduced to are murdered by a former COPRA agent known as Vitas, who then proceeds to blow up a town and have the blame placed squarely on COPRA, and that all literally happens within just the confines of the first issue! I feel bad for the town that blows up. From that point forward the comic follows an interesting trend of showing the remnants of COPRA splitting up in order to work at figuring out why they were betrayed, and recruit former members whom are still among the living--in addition to showing us some evil plotting by a being known simply as "Dy Dy". This all leads to a stellar fourth issue where with everyone gathered the comic kicks into an over-drive of action that doesn't let up through an amazing fifth issue where the team travels to Tokyo in an effort to find the traitorous Vitas and then has an incredibly-illustrated battle with Vitas and his cronies in an absolutely stellar sixth issue that pays off on all the build-up of recruitment and tracking the Vitas down. The story is strong and as you can see from my description moves along quite fast. It has a good mixture of humor and also contains some quite dark and sad content--but never feels overly grim' n' gritty to a point you want to sob. The only issue I have would be that at times the sheer cavalcade of characters being introduced can seem overwhelming to the point I was incredibly grateful Fiffe assigns a sort of name-tag and descriptor to every character that appears in the sixth issue where almost everyone meets up and has the aforementioned brawl. I think Fiffe is fully aware that he has given us a lot of characters because I have read that as of the 13th issue he has been doing quick stories that focus on an individual character and allow us to understand better what, "Makes them tick," so to speak. Look At That Art, Seriously, Just Look At How Great It Is! As I said, the story is strong, but the artwork is what makes me find this comic to be simply amazing. Fiffe has an understanding of the comic-page that I haven't seen in comic-makers much older than he is (Fiffe is relatively young having only been born in 1979). 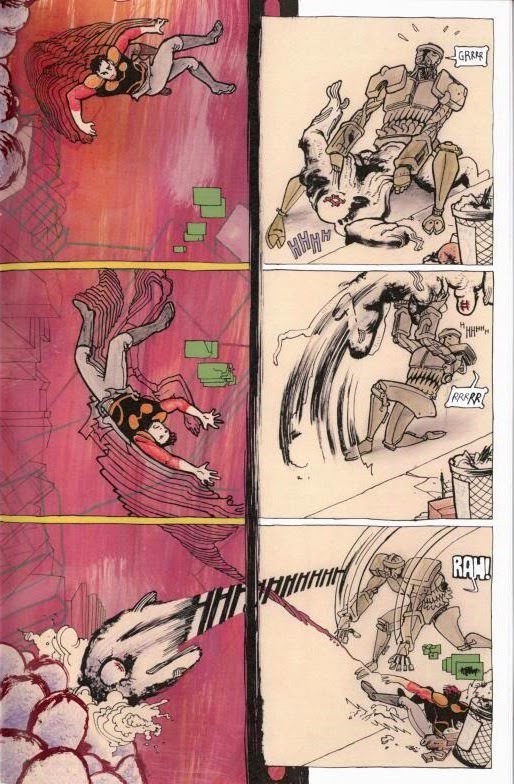 Fiffe illustrates scenes of action in a way that show an understanding of human movement and fluidity in a way that is both at once graceful in how seamlessly the scenes happen and vicious in how violent the moments of action can be. His scenes of fisticuffs or gunfire are drawn in a way that it looks less like violence and more like a ballet of brutality. Fiffe also uses the fact that comics take place on a two-dimensional printed page in a myriad of creative ways, such as in a scene where one member of COPRA throws an inter-dimensional monster back to where it came from and another being flies out of the portal, with half the page being taken-up by the other dimension and the other half on our planet, with the comic cleverly using a black-line of a panel-border as a way to display the "break" between realities. I haven't seen such creative use of the page in comic-making since J.H. Williams III's work on "Batwoman"--which as with most comics I love came to a tragic end due to editorial meddling. "COPRA" doesn't face the risk of such overseers ruining the magic however, because it all flows from Fiffe's mind onto the page gorgeously. Gary has a surprisingly normal name for someone who isn't normal-looking at all. Besides the command of the page itself and a skillful portrayal of action, Fiffe creates characters that are fascinating too, with some looking relatively normal and others being intimidatingly abstract (for instance, a villain named Gary who seems to not have a head so much a series of shapes where his noggin should be). Another interesting thing that gives COPRA its unique look is that Fiffe doesn't seem to ink his pages too much. Often there will be the penciling and color, with a minimal touch of inking to help make certain aspects really, "Pop." This light use of inking results in a comic with a much lighter-look except for those rare moments when a character that is in fact heavily inked stands out from the page starkly and in the process looks even more impressive (The fact that the main villain Vitas is almost purely black-and-white in appearance makes him all the more scary in how he stands-out so much from everyone else on the page and almost looks like he belongs in a different comic). It all makes for just a wondrous read. Vitas, the antagonist whom makes such a great comic possible. Thanks for being so evil, I suppose!